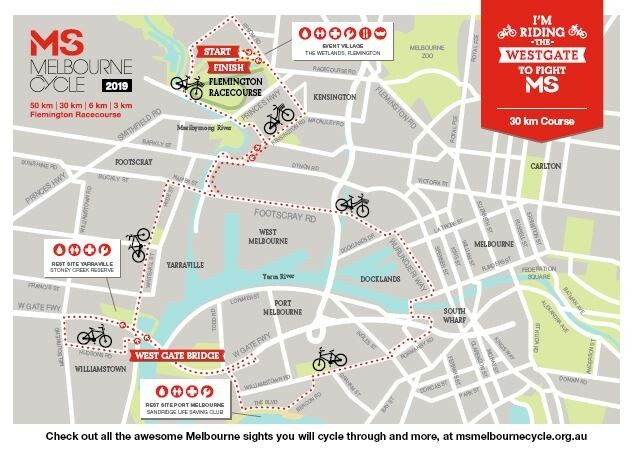 Start your 30km ride at The Wetlands in Flemington Racecourse with a bit of buzz from the event village. It might be early in the morning, but you can expect some dedicated volunteers at the start line to get you geared up and ready to pedal. You’ll ride along the banks of the Maribyrnong River (which is a pretty great spot at that time of the morning might we add), then past Etihad Stadium, and over the Port Melbourne Foreshore. Next, you’ll begin the ascent up the Westgate Bridge, giving your legs a bit of a wake up – as you take in the spectacular views of Melbourne. Usually carrying up to 200,000 cars, trucks and motorbikes every day, cycling over the bridge is one of the most coveted sections of your course. Coming off the bridge, you’ll ride into the top of Williamstown where you can grab yourself a coffee (it’s good, we promise), and jump back on your bike for the last leg of your ride as you return to Flemington Racecourse to our event village. The ride starts at 7:20am and leaves in 20 minute start waves. Your time will printed on the reverse of your bib. Remember, there are two rest stops along the course that you can jump off at and re energise. We’ve got you covered with water, toilets and first aid facilities at both. And don’t stress about getting lost, because there will be 200 volunteer course marshals directing you along the way. Some aspects of the course map may be subject to change.